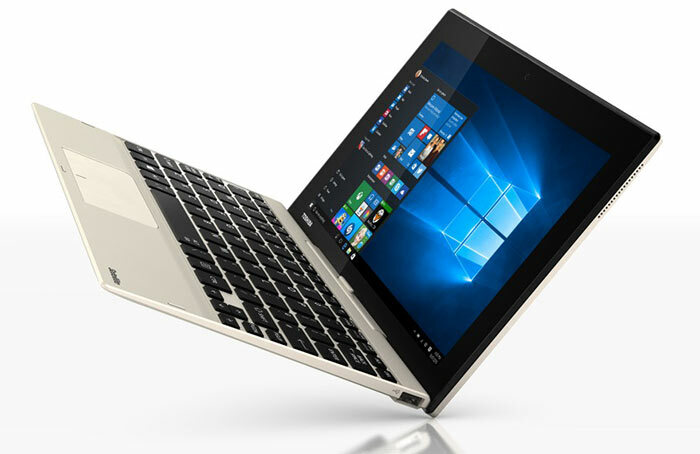 Toshiba grabbed the headlines at IFA 2015 with its Satellite Radius 12 convertible with 4K screen and Skylake processor but it also revealed some more modest devices in the 2-in-1 form factor. The Toshiba Satellite Click 10 entry level 2-in-1 was one such device, and it became available to order in the US on Tuesday, priced from $349. Let's start by looking at the external qualities of the Satellite Click 10. Obviously it’s a 10-inch device that can work as a tablet and has a click-attachable keyboard to help it function like a small laptop. The TruBrite multi-touch screen, with a diagonal of 10.1-inches to be exact, has a resolution of 1,900 x 1,200 pixels. As a tablet the machine weighs just 540g and measures a little over 9mm thick. Add the click-in keyboard with Clickpad pointing device and the total weight is 1.1Kg (so it shouldn't be top heavy) and the device as a whole measures 259 x 185 x 22mm. The Satellite Click 10 offers multi-directional TruTalk microphones, a dedicated Cortana key and a high-resolution 8MP rear camera and 2MP front webcam for video chatting and taking photos. Ports available to users include a Micro HDMI port, a microSD card slot plus, and one USB 2.0 port. There are two additional USB 2.0 ports on the keyboard dock. For audio you get stereo speakers with Dolby Digital Plus. Elsewhere on the tablet you will find the docking connector, volume up and down buttons, a Windows button and a power button. Looking at the internal component specs Toshiba has fitted the Click 10 with an Intel Atom x5-Z8300 processor. The processor is complemented by 2GB DDR3L-RS 1600 RAM (non-upgradeable). Buyers can choose from 32GB of built-in storage ($349 model), or 64GB ($369 model). The Click 10 has wireless networking (802.11a/g/n) and Bluetooth 4.1. Its 2 cell/22.5Wh Lithium Ion battery pack provides over seven hours in MobileMark 2014 tests but is not user replaceable. 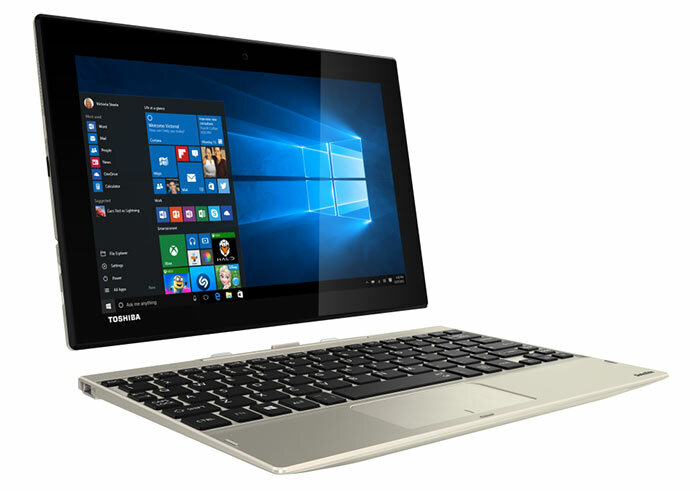 For software Toshiba's Satellite Click 10 comes with Windows 10 pre-installed, which auto-switches to finger-friendly tablet mode when the keyboard is detached. You also get Office Mobile Apps: Word Mobile, Excel Mobile, PowerPoint Mobile and OneNote, PhotoDirector LE, PowerDirector LE and a few other Toshiba utilities. Are my eyes deceiving me or is the doubling of storage only cost $20! I know it's only 32gb to 64gb but some companies would have your eyes! Props to Toshiba for some common sense!